Real Madrid travelled to the Mestalla to face a revitalised Valencia side under the leadership of Ernesto Valverde. Since taking charge of Los Che, Valverde has won seven of his nine games in all competitions. 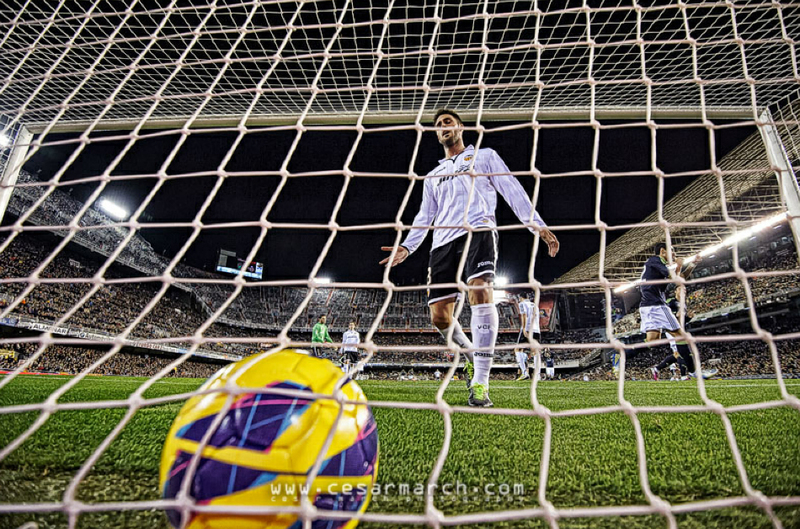 A 2-0 defeat away to Los Blancos in the Copa del Rey in midweek did not dampen enthusiasm before kick off that Valencia could win this game such was the quality at times during their recent encounter. What they would not have expected was to see a first half performance from Madrid which was clinical, professional and utterly ruthless. A reminder of the devastating power which the club from the capital possess on the counter attack which resulted in Valencia suffering their heaviest ever loss to Madrid at home. There were three changes to the side which had defeated Sevilla 2-0. Albelda was injured whilst Pereira and Parejo were suspended. Ruiz, Gago and Tino Costa came back into the side. The surprise was the inclusion of Ricardo Costa being played out of position at right back. Barragan remained on the bench. Mourinho named the strongest eleven available to him with Higuain favoured in place of Benzema in attack. Modric and Callejon made way for the returning due of Ozil and Ronaldo after the disappointment of the goalless draw in Pamplona. A game which began fast with Valencia seeking to impose their style of play on Madrid soon descended into a nightmare for the home side as Madrid picked them off on the counter attack. The patience shown a few days earlier at the Bernabeu was replaced by a frenetic style from Los Che perhaps determined to show they could compete.It was an ill advised strategy. By increasing the tempo of their game and lacking composure, Madrid were content to sit deep and pounce forward, the opening goal being a prime example. As is so often the case, Madrid are most dangerous when you attack. Ozil evaded Banega on the edge of the penalty area and 13 seconds later Higuain scored. The confusion in the Valencia defence evident with Gago appealing for offside with Guardado a few yards deeper than him. Three of Madrid’s goals originated down the Valencia right where Costa was clearly uncomfortable. Ronaldo played a neat one two with Ozil and burst beyond Costa before eventually cutting back for Di Maria whilst the third goal was farcical from Valencia’s perspective. Both Costa and Rami diving in at the halfway line whilst Ruiz and Guardado were over five yards deeper on the other side of defence. The high line and a lack of coherent pressure on the ball provided the script for a seamless display of attacking prowess from Madrid. Madrid also pressed Valencia very quickly. Valverde demands the play to be built from the back but Valencia do not yet have the players to do so properly. Too often Valencia were robbed in possession. With the game won, Madrid then eased off. The graphic below shows the player positions during the game with Valencia in blue and Real Madrid in red. Although at right back, Costa is the deepest Valencia player with Rami positioned very close to him. Guardado meanwhile is beyond the halfway line but isolated by the narrow position of Jonas who should have been on the left wing. Gago is also positioned too far to the right with Costa and Banega stationed very high. The team is fairly compact as Valverde would want but it’s unbalanced. The high line is not supported by pressure on the Madrid midfield. Banega and Tino Costa are too high probably in an effort to support Soldado. The defensive set up was uneasy throughout the match and Madrid exploited the uncertainty ruthlessly. For Madrid the position of Ozil is crucial, practically level with Higuain and beyond Gago. From the outset Ozil was operating between the lines and this was a key factor in Madrid ’s fifth goal. 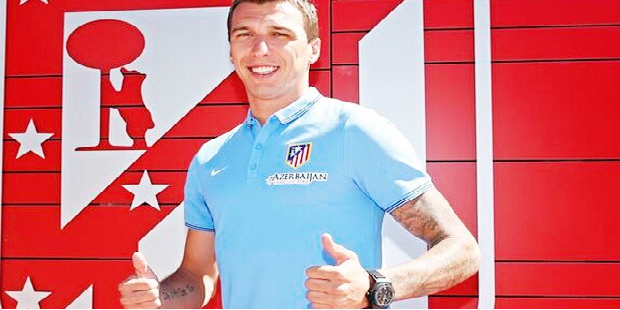 He is already beyond Gago when he collects Albiol’s header forward. Despite the scoreline, Valencia actually had more shots at goal than their opponents again demonstrating that as useful as statistics are, they need to be investigated a little more closely. 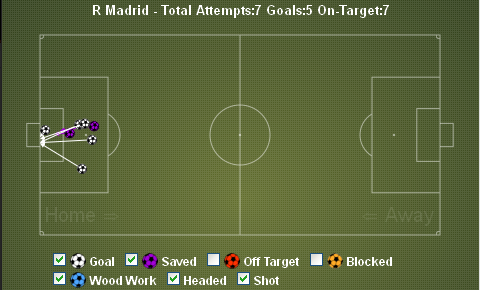 Madrid had 13 shots at goal of which seven on target, scoring five goals. Valencia had 20 shots at goal but many were speculative and long range. Just three were on target with Piatti also hitting the crossbar. The graphic below shows all of Madrid ’s shots on target. With the exception of Ronaldo’s first goal, all of Madrid ’s shots were within the penalty area and very central. They were incredibly efficient in front of goal. With fewer shots at goal than their opponent, Madrid also had less possession as they continue to resort to a predominantly counter attacking style of play. Di Maria made 34 passes from 47 passes attempted, more than anyone else in the Madrid team. His return to top form was marked by two attempts on goal and two goals coupled with an assist for Higuain. Since the arrival of Mourinho, Madrid have developed a counter attack which is arguably more potent than any other side in world football. From the first season position whereby the Madrid team appeared to be two units held together by Xabi Alonso and reliant upon individuals, they moved forward to last season’s Championship winning side when the unit functioned well as a whole. This season, they appeared to have regressed towards that first season model again. They seek to sit deep and break quickly, utilising their pace on the flanks. Play is seldom constructed thoughtfully partially explaining the problem that Modric has faced in adapting. They have become direct and rely upon moments of individual brilliance to overcome opponents. Last night provided further evidence of this but also provided a glimpse of how this simple style can take the opposition apart. Madrid completed just 225 passes from 315 attempted giving 71% accuracy. They saw less of the ball but when they had possession, they used it much more effectively. Previously, Xabi Alonso would be at the heart of Madrid ’s play yet last night produced a fairly subdued performance. Alonso 22 passes completed from 30 attempted in his 57minutes on the pitch as the graphic below illustrates. Contrast this with Ever Banega who Valencia tried to get on the ball as often as possible to create. For comparison with Alonso, Banega completed 31 passes from 35 attempted (89% completion rate) in the first 60 minutes. In the 90 minutes as a whole he completed 51 passes from 61 attempted. Yet despite all the volume of passing and the fact that Banega made five key passes, there was no end product for Valencia . As at the Bernabeu they were capable of weaving pretty passes across the pitch with no punch. Mesut Ozil floated around the pitch operating between the Valencia defensive and midfield line creating problems despite making minimal passes. Ozil made two assists with his team mates in an excellent performance. Often ignored amongst elite sides is the workrate. Too often the less attractive side of the game is overlooked but Madrid were highly competitive last night. Valencia won 9 tackles form 10 attempted yet compare this against Madrid who won 20 tackles from 24 attempted. Madrid were ready to compete on the physical side of the game. Just as at Levante when they had to become competitive, Madrid were ready to stand up to the challenge. As good as Madrid were in the first half, it’s impossible to consider their performance without commenting on the poor defensive performance from Valencia especially on the right side of their defence. The decision to play Costa at right back ahead of Barragan was, in hindsight, probably a mistake if only for the most natural balance that Barragan would have brought to the side defensively. With Guardado continuing at left back and prone to positional mistakes, the side badly misses Mathieu. Madrid committed 13 fouls in the game with only two fouls occurring on their left side. Valencia were too reliant upon their left side with Guardado, Jonas and Tino Costa all leaning towards that area. The graphic highlights one other issue. Madrid were extremely good at not conceding fouls in and around their penalty area. Only two of the above fouls could really lead to balls being whipped into the penalty area. The remaining fouls were committed too far away. Valverde made one change at half time with Barragan replacing Fernando Gago. With Barragan moving into right back, Ricardo Costa went into central defence and Victor Ruiz was pushed forward into a defensive midfield position. The key concern for Valverde would have been to avoid a real hammering which was a realistic possibility at half time. The move solidified Valencia and they created a number of decent openings with Piatti striking the cross bar from just outside the area. Madrid though, had stepped down a level by this point and the game game drifted towards it’s inevitable conclusion. There is much for Valverde to ponder over prior to Madrid returning to the Mestalla for the second leg of their Copa del Rey tie this midweek. The tactician now has a decision. Does he believe that his side can go out and impose themselves upon Madrid to attempt to recover the tie or does he become more cautious, drop the defence deeper and play a conservative game as a consequence? Was it really the high line which was the downfall of Valencia ? Osasuna played a similarly high line recently and secured a draw. With Madrid increasingly using the counter attack again, a deeper defence could allow Valencia to control possession and the game but the problem then remains of how to support Soldado in attack. For Madrid, at least Mourinho knows that his side are still capable of producing a high performance level even if he has seldom witnessed it this season. The pace and power of their attack was superb at times and will certainly deliver a welcome boost for the team particularly when they have often struggled away from home this season.